001. She's a quick study! 002. Sometimes she feels like a big dork. 003. She's not nervy just honest! 004. She went to film school in NYC. 005. She's a model turned actress! 006. She was the lead in her first movie - Tuck Everlasting! 007. 'Cause Wendy's 99 cent chicken nuggets make her really happy. 009. 'Cause she's "like a little Betty Homemaker!" 011. 'Cause she absolutely refuses to eat shellfish! 012. 'Cause she keeps in touch with her younger side by eating Rainbow Sherbert ice cream! 013. Because she loves Target! How down to earth of her! 019. 'Cause she was on the cover of Vanity Fair! 020. 'Cause her big blue eyes are insane! 021. 'Cause she worked with Oscar winners Sissy Spacek, Ben Kingsley, and William Hurt all in one movie. 022. 'Cause she's branching out and doing independent movies like The Orphan King. 029. 'Cause traffic drives her crazy! 051. 'Cause she didn't know what "hit your mark" meant. 052. 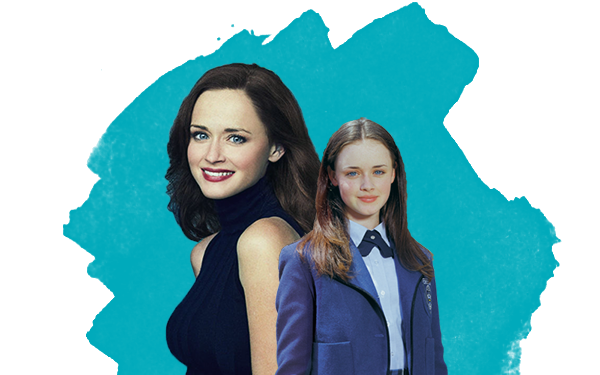 'Cause she can extend her childhood a little longer playing Rory. 054. 'Cause she had a whole system to get out of gym (forging signatures). 057. 'Cause she hopes it not going to be boy sagas for the rest of Gilmore Girls' run. 059. 'Cause she's using Goldilocks as a catharsis for playing such a sweet person daily. 060. 'Cause she's obsessed with Dolly Parton! Who'da thunk it? 061. 'Cause she's willing to break dance for a t-shirt! 066. Because she's a mom now! 001. She reads anything and everything. 002. She attracts cute boys like bees to honey! 003. She's in the top 3% of her class! 004. She's Chilton Prep's Vice President! 005. She's the sweetest kid in the whole world. 006. 'Cause she's like Lorelai, only she's got a slightly firmer grasp on reality. 008. 'Cause she can read a map. 009. 'Cause she doesn't want to flaunt it. 020. 'Cause she's going to Yale! 021. 'Cause she works at the Yale Daily News, and she's majoring in English and Political Science! 022. 'Cause she had to drop a class. 030. 'Cause she gave her mom the world's largest pizza sort of. 042. Cause she sang "Baby Face" without ever saying the word "Baby"
045. Cause she rolled into a ditch on her first pony ride. 046. Cause she's not really a mean Girl Scout (LDaT). 060. 'Cause she doesn't want to be labeled "the late girl"
071. 'Cause she won't let Lorelai date Luke. Oh, wait. That's why we hate her. 074. 'Cause she wants to travel around Europe with her mom (and they did!). 075. 'Cause she told Lorelai she got a foot fungus from the steam room to make her feel better. 076. 'Cause who would've imagined that a young girl could enjoy a simple afternoon with her grandfather. 077. 'Cause she needs serious paper. 079. 'Cause she'll help Lorelai push people out of the way when they're going for her size. 080. 'Cause she got hit by a deer and then stopped to check if it was all right. 081. 'Cause for the last time the name is RORY! 082. Because she's eight and her favorite hobby is making necklaces out of gum wrappers. 088. Because she's not Daddy's (Christopher's) little girl, not by a long shot. 089. Because she's protective of Luke. Thank you. Yep great title. I'm so glad she was recognized for her exceptional work on THT. Only a couple more months now until the new season. Figured we needed something pertaining to the title of this thread. I need to look for a better, smaller pic with her Emmy. Any suggestions? And you delivered! Thank you! Could we add it to the OP?